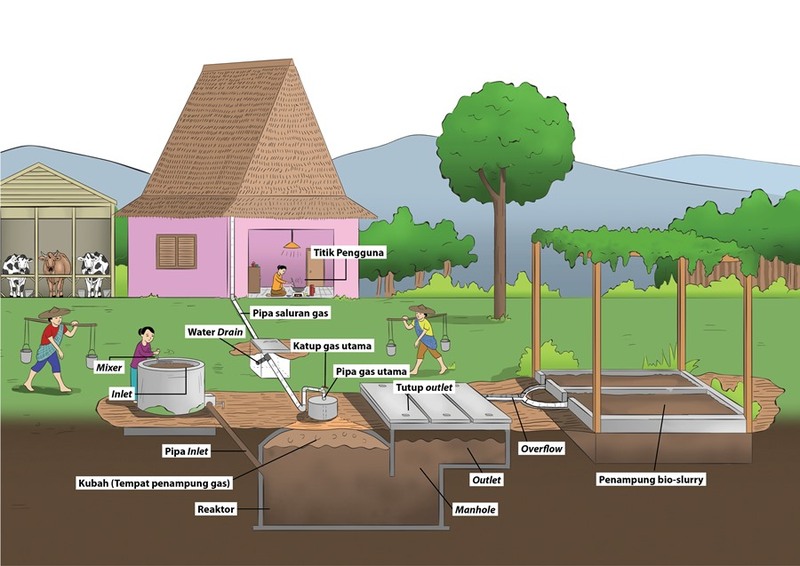 BIRU’s biogas digesters/reactors function as converters of animal dung, and possibly human excrement and other organic materials, into combustible biogas. Uses of biogas consumption in households, among othersare to fuel simple gas stoves for cooking and lamps for lighting. Reactor technology selected for BIRU is the fixed-dome reactor is an adaptation of existing systems used in other countries such as Bangladesh, Cambodia, Laos, Pakistan, Nepal, and Vietnam. This fixed-dome reactor is made from masonry and concrete work concealed underground. The system is proven to be environmentally friendly and a clean energy source. In Nepal, this technology is used in over 200 thousand households for more than 15 years, with 95% of the reactors currently still functioning. The fixed dome biogas plant has a minimum lifetime of 15 years if properly used and maintained. Maintenance is easy, it merely requires the occasional checking and – if necessary – repair of pipes and fittings. To operate one unit, the farmer needs to have at least 2 cows or 7 pigs (or a flock of 170 poultry) to produce enough feed for thereactor to be able to generate sufficient gas to meet their daily basic cooking and lighting needs. There are 6 main parts to the digester: Inlet (mixing tank) where animal dung is inserted to feed the digester, reactor (anaerobic/non-oxygenated digester chamber), gas storage (storage dome), outlet (divider chamber), gas carrier system and the bio-slurry pit or the animal dung compost pit which has been reduced of any gas (deducted of all gases). A combined mixture of feces and water (which takes place in the inlet or the mixing tank) flows through the pipeline towards the digester. The mixture produces gas, through a process of digestion which takes place in the reactor, and is then stored in the gas storage chamber (upper side of the dome).